Uruguay Olympic football team (also known as Uruguay under-23, Uruguay U-23) represents Uruguay in international football competitions in Olympic Games. The selection is limited to players under the age of 23, except three overage players. The team is controlled by the Asociación Uruguaya de Fútbol (AUF). Uruguay won two gold medals (1924 and 1928). Uruguay's first participation in the Olympics was in Paris, France, in 1924. In that year, Uruguay won its first gold medal, beating Yugoslavia 7–0, United States 3–0, France 5–1, Netherlands 2–1, and in the Final defeating Switzerland 3–0. 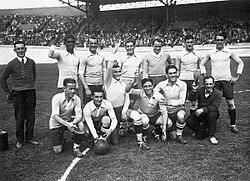 Uruguay's second participation in the Olympics was in Amsterdam, Netherlands, in 1928. In that year, Uruguay won its second gold medal,beating Netherlands 2–0, Germany 4–1, Italy 3–2, and in the first Final tying Argentina 1–1, and defeating Argentina 2–1 in the second final. In the other semi-final between Switzerland and Sweden the Swiss prevailed. In the final the Swiss proved no match, ultimately, for the Uruguayans whose two goals in the second half put paid to their opponent's ambitions, Uruguay eventually prevailing 3–0. Interest in the final had been considerable, such was the draw of the Uruguayan side; 60,000 watched and 10,000 were locked out. The following players were called up by Óscar Tabárez for the 2012 Summer Olympics being held in London, Great Britain. ^ "SUB 23: URUGUAY Y EGIPTO EMPATARON 0:0". Tenfieldigital.com (in Spanish). 25 April 2012. Retrieved 16 June 2012. ^ "Uruguay encendió la llama con goles..." Tenfieldigital.com (in Spanish). 11 July 2012. Retrieved 11 July 2012. ^ "Uruguay se despidió con sonrisas". Tenfieldigital.com (in Spanish). 15 July 2012. Retrieved 15 July 2012. ^ "Olímpica: Tabarez confirma a los dieciocho jugadores". Tenfield (in Spanish). 9 July 2012. Archived from the original on 29 September 2012. Retrieved 10 July 2012. This page was last edited on 16 February 2019, at 15:35 (UTC).